In this show I gave a brief introduction to Database properties and most importantly to Access Control lists for the database. There’s nothing really* here for the experienced Notes developer but if you’re new to the platform you might find the talk on the Access Control lists interesting. In this show, Jesse Gallagher officially starts the NotesIn9 Hackathon with a great introduction on “custom renderers” in XPages. While this seems to be a really scary topic, Jesse explains it in a way that even I can grasp it. It’s time for me to get off my duff a little bit and try and “kick this up a notch”. To me a Hackathon is an event were people come together to contribute small pieces to complete a bigger puzzle. I’ve been thinking of this ever since someone came up with the #CodeForTim hashtag. 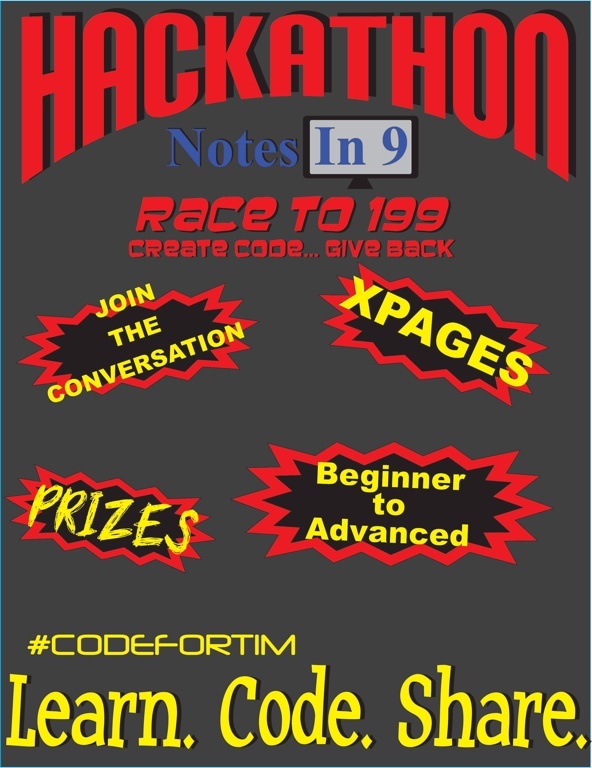 When we lost Tim, I changed the motto of NotesIn9 to “Learn, Code, Share” to honor my friend and better reflect the mission of NotesIn9. Well that’s what this Hackathon is all about. I want to try and increase the output of NotesIn9. More shows with a better range of subjects. I want to try and get NEW CONTRIBUTORS. And I want to try and get more questions, answers, ideas, comments and discussion going. Typically when I get a new contributor on the show, it’s someone I’ve noticed and I’ve reached out to them privately and begged, pressured, or plain out annoyed them until they decided to come on the show. Today I’m calling for Open Submissions. If you’re working with XPages – no matter how basic – you have content you can share. Think up an idea and email me and lets talk about it! There’s no reason to be scared. You do NOT need to be an “expert” on the topic. If you do a show the worst possible outcome is that someone comments that there’s a better way to get the same result. Now you and others will learn that better way. Win Win! If you simply can’t share, because your company forbids it, then start leaving comments by asking a question, validating the material or simply just thank the contributor for their effort. Let your voice be heard! The more comments and people interacting, the easier it is to get contributors on the show. I’ll post later some suggested topics but pretty much everything is open to discussion. Even non XPages based shows. Learning is learning. Period. So what’s in this for you? I firmly believe the more you share the more you gain. You start by gaining knowledge, experience, and confidence. From there you might gain friends, start speaking at different events and who knows, maybe even get a dream job. That’s what happened to me. In the event that isn’t enough there will even be prizes! Details will be forthcoming. Let’s all see what we can build and then let’s all share it!